Have you ever been struggled to find a perfect fitting shirt? UKYS is a new kind of fashion company that enables customers to design and purchase premium, tailored shirts measured by your phone just $69 each. That’s well below what one might expect if they went to a tailor to have a shirt fitted, and even less than some people will pay if they were to buy a dress shirt off the rack from a department store. Plus, the way they fit the shirt to your body doesn’t involve any tape measures or having to figure out if your shoulders are square, sloping or both. All shirts are crafted with obsessive attention to detail: strong collar, removable collar stays, mother of pearl buttons, refined side seams, soft label and tightly sewn buttons. Fabrics are made in Italy – they only use the finest cotton. All fabrics are Oeko-Tex Certificated as well as long-term color consistency guaranteed. Almost all the shirts are from 80’s 2-ply, which is almost the best you can get. At the heart of the UKYS app is LIM (Less Is More), a technology developed by our in-house engineering team to perfectly capture the measurements a tailor would make, but from your phone instead of a costly visit to the tailor. LIM has been developed and refined over the course of a year. Hundreds of prototypes were tested before we felt the app was able to consistently determine measurements to the same level as our own professional tailors. With just five standing posture photos, which you can take in the comfort of your own home, LIM Technology is able to create a 3D model of your body from which your body measurements are taken and used by the UKYS app to apply to your orders. UKYS app makes it simple and free to take measurements from home using only an iPhone or iPad camera. It only takes a few minutes for clients to complete the five-step guided measurement process, the app uploads all of the information into the UKYS system and their LIM Technology converts the data into a remarkably accurate 3D model from which the client’s body measurements are taken, thus saving time and money that would have otherwise been spent on visiting a tailor. There’s even a built-in face censoring function to assuage any privacy concerns. The final product is a luxury bespoke dress shirt delivered directly to the client’s doorstep. STEP 1: After you back on Kickstarter, you will receive your UKYS account and UKYS Getting Started Guideline via your email. STEP 3: Open UKYS app to design your shirt choice and get measured. STEP 4: Enjoy the Perfect Fit of your custom shirt. The app and measurement capturing is UKYS innovative technology, but the final product, a UKYS shirt, is individually crafted by the skilled hands of our tailors. UKYS, a family business, is a recognized leader when it comes to suit tailoring. They have over 15 years of experience in the tailoring business and have clients around the world. This fashion-meets-technology app is the brainchild of Tran and Lam Nguyen. 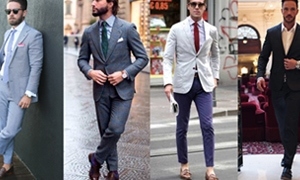 Together they have a unique combination of experience in both the IT sector and in tailoring. The app has been in development for over a year after extensive testing, it is complete and can be downloaded from the Apple Store since Nov 21st. UKYS is now on Kickstarter, so make sure to back them up.